Our fully equipped MIDI recording studio is based around a Soundtraks Topaz 64 channel mixing desk and an Akai DR8 digital multitrack system. 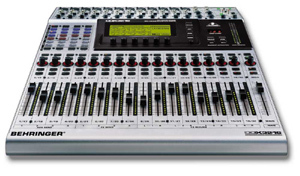 It is more than capable of producing everything from vocal recordings and sound effects to full musical compositions for use in video and media productions. We have considerable experience in recording voice messages for use in automated telephone messaging systems. Using 'close mike' techniques and superior quality Sennheiser microphones, we are able to produce hiqh quality voice messages that will be clear and easily understood by the caller. The recordings can be compressed to reduce the dynamic range and finally supplied on CD-ROM for loading into your telephone system. We are happy to work with your 'vocal talent' or supply a voice for you. We can produce contemporary music to suit your company image for use whilst your customers are on hold. We can even produce 'on-hold adverts' that can convey to your customers an overview of your services and products. We have a range of 'stock' music that is available for royalty free use. We possess a large library of sound effects, atmospheres and music that has been created in our studio; this is available for royalty free use in your video productions, digital presentations, websites or computer games.